This is the last Wednesday in August, so this is going to be my last official SMA Awareness Month post of 2017. I've really enjoyed writing them, and I hope that you've all enjoyed reading them - I plan to keep writing SMA-specific posts, just maybe not as scheduled as they've been so far. This picture was taken last year during a trip to NYC. My family and I have a trip to NYC coming up very soon - we're going to see Hamilton and visit one of my best friends from college, and I could not be more excited. I really enjoy traveling - I like going to new cities and exploring, and really love trying new restaurants in those cities! 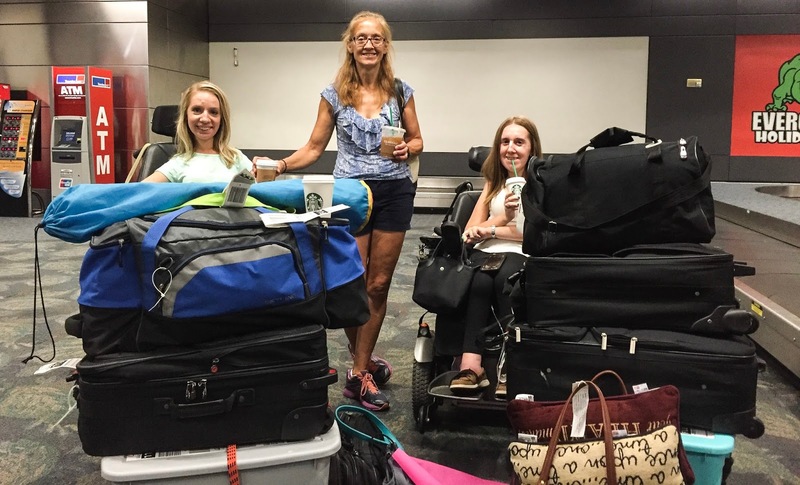 But traveling with SMA, or with any physical disability, can also be incredibly stressful and difficult. This difficulty starts from the very beginning of any potential trip planning - deciding where to go. For driving trips, my family basically has a 5-6 hour limit - any longer than that, and it's too much for one day. This is partially because driving in the car isn't just relaxing for me and my sister as passengers - it actually takes strength for us to balance and sit comfortably in our chairs for extended periods of time. The other main limiting factor on driving times is planning out rest stops - or really, lack thereof. We have so much equipment packed for trips, regardless of length (more on this below), that by the time my sister and I are both able to get out of the car, go to the bathroom, and have a little snack, it's easily been an hour, which means we get to our destination an hour later and an hour tired-er. So, my mom or dad may make a quick pit stop while we're on the road, but my sister and I don't - and obviously, this is only possible for so long! So why not just fly? Well, it turns out it's not quite that simple. First of all, only certain larger planes can fit two wheelchairs in the cargo area of the plane. We had an awful experience once where we arrived at the Philadelphia airport after a red-eye from LAX, only to learn that our wheelchairs weren't going to fit in the plane we were supposed to take to go home - even though we had called and had a very long, very detailed phone call with the airline to make sure something like this didn't happen. And then, once we find a plane that we know will fit our chairs, we have to look at the flight routes - where can we fly directly from Pittsburgh, with no layovers? Because our wheelchairs get taken at the gate and stowed in cargo, we're always the first ones on the plane and the last off. That would mean that if we had a layover, we'd have to allow an extra hour or so for that alone. And then when you add in bathroom stops, a meal, and picking up a wheelchair accessible minivan at your destination, you've just lost an entire day to travel. And the equipment that I mentioned above - that also has to all come on the plane. It's a lot to pack and cart around, and you have to cross your fingers and hope that none of it (or your wheelchair!) gets damaged during the flight. This is our luggage for a stay in Fort Lauderdale, Florida. You can see the bins at the bottom of the pile - they're full of medical equipment! So let's talk about this equipment - there's a lot of it. I use a ventilator at night, as well as a feeding tube. The ventilator is the machine itself, plus the tubing, plus the mask I use. The feeding tube is the pump, a tube that connects me to the pump, a different "bag" for each night I'll be away that the formula goes in, plus about 2-2.5 containers of formula for each night. I also have a CoughAssist breathing machine that I use daily (plus the tubing! ), and my sister and I both need our wheelchair chargers. These are just the basics! They take up quite a bit of room, and are also a hassle to unpack and set up once we arrive. 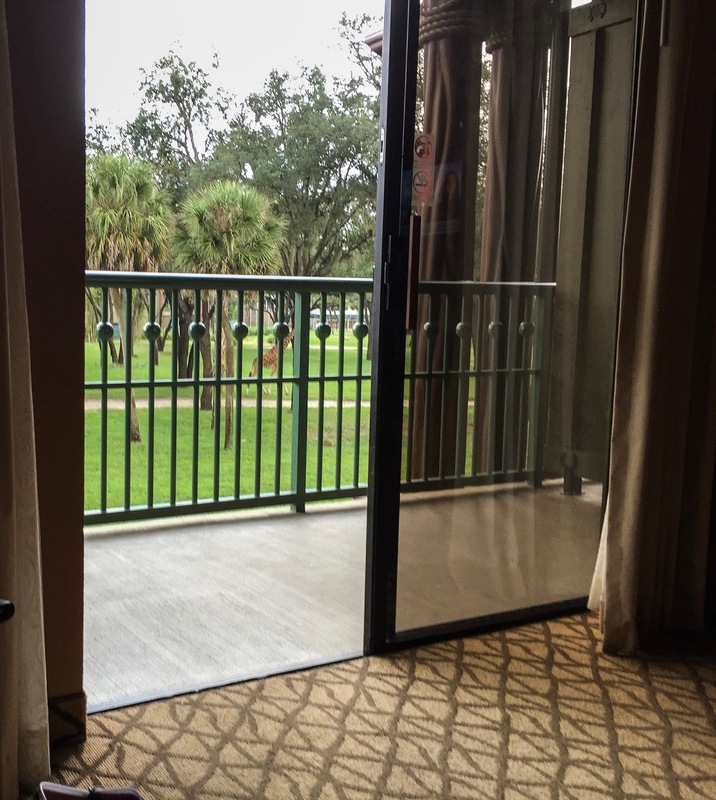 Example of why Disney is so great - the balcony in their wheelchair accessible room doesn't have any sort of lip, so it's easy for a wheelchair to access! There's so much more that I could talk about - finding a wheelchair accessible suite that actually has space to move around in, finding accessible transportation, whether that means renting an accessible minivan or taking public transportation, if that's available. Making sure that any and all activities, stores, and restaurants are wheelchair accessible (which does not mean "just one small step to get in, but other than that, yes"). We've definitely learned, over the years, places that are better to go - Disney is always amazing with accessibility - and places that are more difficult (the NYC subway system is largely inaccessible). What I said at the beginning of this post is still true - I really do love traveling! And knowing what is involved in traveling makes trips like my upcoming NYC trip a little more special. If we're willing to put up with all of what I mentioned above to go on a trip, it means that it's something we really care about. Yes!! That is a whole other story and one that I will never ever ever forget!